Hotspot Access - How Much Does it Cost? How does this compare with freenetwork model? Who Owns the Home Network? This study looks at how wireless networking (WLAN) in London has developed over the last three years from hacktivist pastime to mainstream pursuit. Comparing networks built by freenetwork groups, commercial hotspot providers, and public sector initiatives the study also examines the sales and uptake of WLAN equipment and makes some direct measurements of wireless activity in the Greater London area. Finally the study looks at the development of WLAN in the home and makes a recommendation for a Wireless Festival for London in 2004/2005. Before we look at the State of Wireless London let's briefly examine the State of London by looking at a few key readily recognisable cartographical elements that are commonly used to delineate it. As a civic settlement the city was most likely founded by the Romans around 47 AD and called Londinium. The name was derived from pre-Celtic Old European - Plowonida meaning something like wide flowing river 1. The settlement was at a strategic crossing point of Thames and also formed a useful port. After the Roman invasion of AD 43, having a centre that could act as a hub on their existing sea borne network would have been important to maintain chains of command and trade with the rest of the empire. The archaeological remains that date Londonium's foundation is a wooden drain found next to the start of the Roman Road, which points to Londonium's role as an early intermodal transport hub. To represent this network prehistory from when London was a prime green field site awaiting development, I have included the river Thames, the emblematic north south split at the centre of London, and the environmental feature that led to its initial location. Jumping forward in time past different eras and over the administrations that have ruled London since Roman times, we come to 1965, and the creation of the Greater London Council. Since 1887, London had been administrated by the London County Council, which had been under Labour Control since 1934. 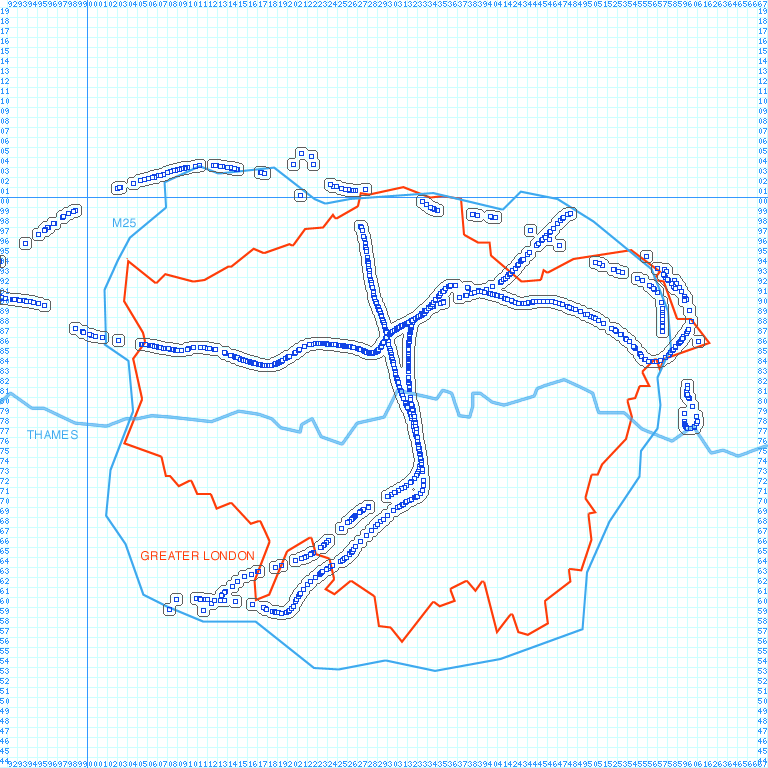 A Conservative government sought enlargement of the Inner London boundary to include the Conservative voting suburbs. This was completed in 1965 and resulted in a body with much infrastructural responsibility including public transport and road schemes. Ironically, despite several Conservative administrations, the GLC was to always be governed by the party that was in opposition nationally. In the 1981 elections - when the Thatcherite government was in full swing - control went to Labour and Ken Livingstone with his leftist agenda. Ideological conflict between the GLC and Central Government, presented at the time as differences over budget allocation, eventually led to the abolition of the body in 1986. 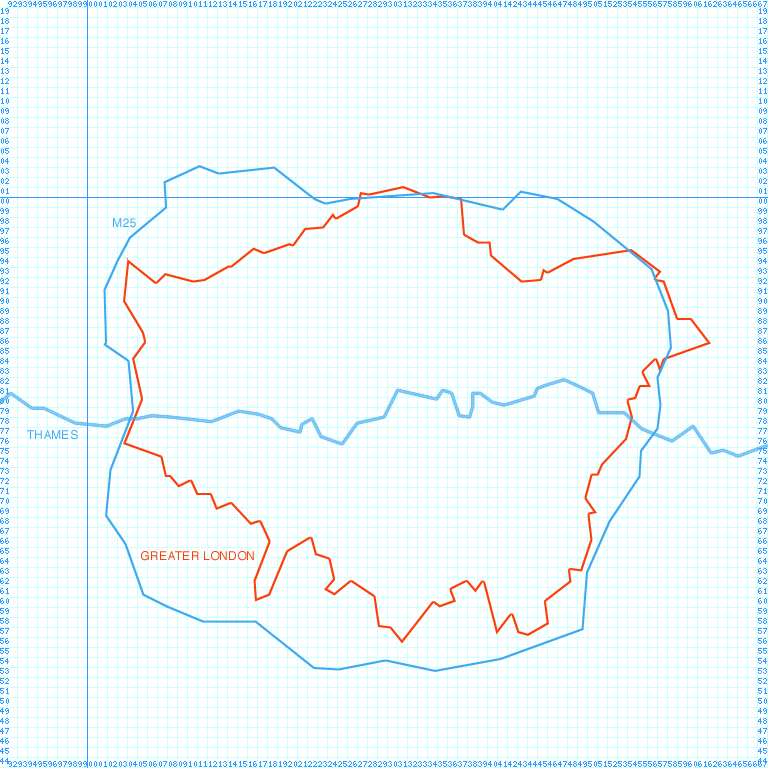 The civic boundary drawn in this map marks an identity for London and its infrastructural administration as being a site of political contest, and marks the tension between London's dual role as sovereign city state within the nation state, and as the capital of the nation state. 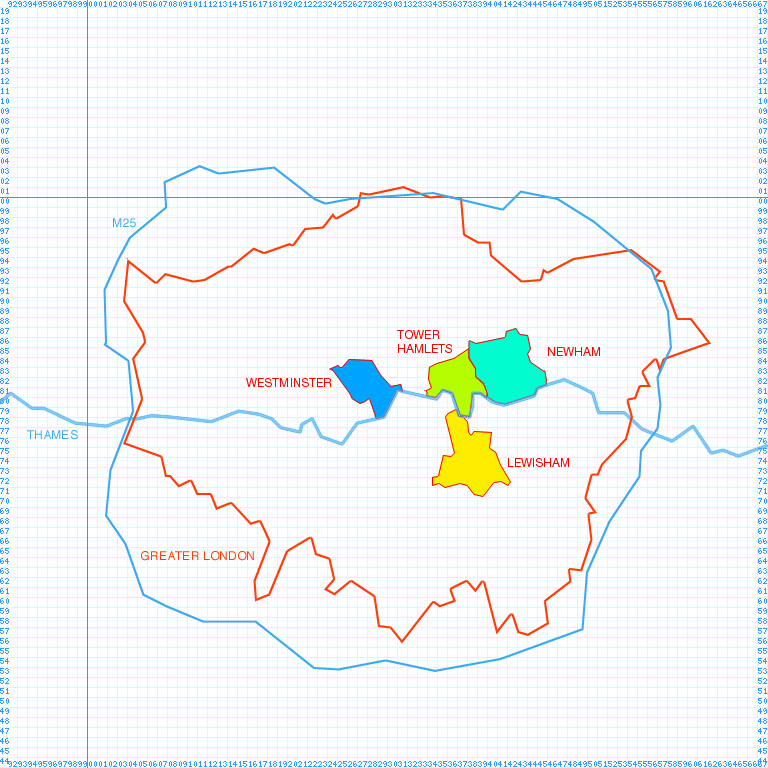 After the abolition of the GLC in 1986, administrative control of London passed to the constituent boroughs. London was left without any coherent leadership and without a clear cartographic image to represent it.After over ten years of construction the M25 was officially opened by Margret Thatcher in October 1986, neatly filling this identity vacuum. London was redrawn as defined by its place in the road network, reinforcing the centrality of the car culture with its focus on the individual, creating new opportunities for badge engineered status symbolism and embodying the packetisation of private transport. The M25 had its own unforeseen network effects. By connecting the edge of London's road network for the first time, a space was created for the emerging rave culture. This culture, with its DIY bedroom music studios and self-organised parties was in some ways a precursor to the new digital media landscape. Techno, not actually very digital in its production process, gave an image or maybe a feeling of the future networked digital utopia. As the focus shifted towards a more inward looking view, a view into the network and the possibilities it offered, place and location became less important and were replaced by transglobal connection, the spatial magic of the internet. Following the dot.com boom, a period of distorted values and valuations where everything touched by the internet lost its connection to geographic and economic realities, there came the crash in 2000. Independent and ground-up approaches to new technologies emerged in its wake, and wireless networking was one of these. Wireless freenetworking came as an antidote to the commercial pipe dreams of telcos and investors, and with its focus on the ownership of infrastructure and local and co-operative action, it can be seen as a grounding of internet utopianism in something real, useful and manageable. Over the last three years the wireless and free networking space has developed rapidly around the world, and now we can take a moment to look at London through a fresh set of eyes, to map a new layer on the map of London's infrastructural history, the State of Wireless London. Wireless is a versatile term that conjures up images of war time huddles around Bakelite sets and describes a huge range of electromagnetic emissions including long wave, shortwave, visible light and radar. This study does not look at the entirety of wireless activity but focuses only on a certain radio frequency and a group of technologies that has been an enabler for freenetworking - the self-provision of computer networks. This frequency is 2.4Ghz. It is one of the few frequencies available in the UK for use by citizens which does not require a license from the national regulatory authority. This arrangement is termed license exemption, and 2.4 Ghz is peculiar in that it is license exempt in many jurisdictions around the world. This exemption is the result of the status of 2.4 Ghz as part of a guard band around the frequencies used by microwave ovens, which was considered by regulators to be a trash band, unusable on noise grounds. It was therefore opened up for public use, though within strict power limits. In contrast to other bands, this exemption meant that there was no licensing restriction or cost of usage, and technology vendors focused on the band as a place to develop products justifying a large r&d spend with a potentially huge market opportunity. Even though the band had been declared an unusable trash band, the low opportunity cost and international market for products drove technological innovation to overcome these difficulties. Product development was also enabled by open standards in particular the 802.11 group of standards(b, a, g) developed by the IEEE 3 Just as the 802.3 standards that define wired Ethernet ensure that any compliant network device connected to an Ethernet network will work correctly, the 802.11 standards strictly define wireless LAN. The existence of the standards allows for vendor-neutral interoperability, in effect creating the space for a WLAN market to develop. In 2000 these factors came together with the release of 802.11b products operating in the 2.4 Ghz band. They were high speed, compared to other wireless networking technologies operating at up to 11 Mbps, and above all cheap. The products were rapidly taken up by people wishing to self-provide their own networks and prices have continued to fall and speeds to rise, as WLAN equipment becomes a cheap commodity and the technology improves. 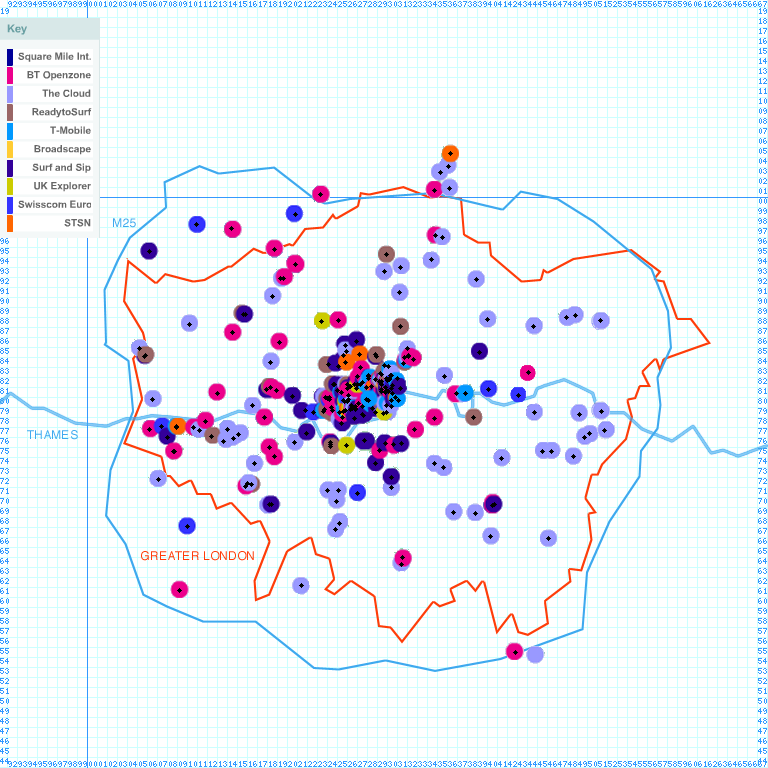 This study looks at London through eyes tuned to 802.11 activity in 2.4 Ghz, and surveys the various groups that have taken it up. This type of networking is called either by the technical standard '802.11b', the marketing term 'WiFi', or the generic 'wireless'. In this study I use the term 'WLAN' for wireless LAN as a non-technical, non-marketing, but more specific term. Unlike other areas of the radio spectrum, the license exempt nature of 2.4 Ghz means that there is no formal procedure required to register usage. Regulation takes place at the device level and the regulator has no idea where equipment is installed or used. This simplicity contributes to the popular appeal of license exemption. In other frequencies such as those used by GSM, registration is mandatory and the Radio Authority holds a public database of GSM installations 4 In quasi-exempt frequencies such as 5 Ghz band C there will be a registration requirement for a minimal fee. Planning authorities are also rarely informed of installations as the antenna size used is unobtrusive and normally does not require planning permission. This means that the regulator does not keep statistics on coverage or usage in 2.4 Ghz and it has been up to user groups and other interested parties to construct their own databases of installations and maps of uptake as needed. Examples of these were created early on by Wireless Freenetworkers, later to be followed by commercial providers. Early in the development of Freenetwork Groups, databases of node installations and intended locations were established both to attempt to locate local people interested in self-providing networks and to publicise the existence of the networks for roaming third parties to access. Examples of these are the Consume node database 5 and international freenetwork mapping efforts such as nodedb.com 6. As commercial providers began to roll out their wireless network services, so too they have started building node maps of WiFi coverage and location. Jiwire 7 holds a comprehensive database of commercial hotspots that Intel uses for its Centrino certified hotspot campaign and the Ordnance Survey 8 also maintains a map used by Zdnet and others. Notably among all the mappings of wireless activity there are no maps that show both commercial activity and freenetwork activity together. The public view of the state of Wireless London is split, depending on where and how you look. Here we collect data from these three sources into one map, not as a definitive guide but as a statement of intent to effectively map the state of wireless in London in all its forms, and see a new view of London's contemporary information infrastructure emerge. A Free Network is one which is owned and operated by its users, and allows for the free (libre) transit of data across it. By connecting many smaller freenetworks a larger network can be constructed and the sum of these is often termed The Freenetwork. Wireless networking makes this patchwork of networks possible in an urban environment like London by removing the need for running wires over different properties. Wireless freenetworking as an idea has strong roots in London. The Consume project was one of the first to propose using the 802.11b equipment that had been originally been designed for home and office internal networking for building local user owned infrastructure. The project came out of 3 years of practical experience that started in 1997 with a link between two buildings on either side of Clink Street. The link between Backspace and Mediumrare provided access to an expensive internet leased line 10 using earlier 802.11 equipment. While an expensive solution at the time, it enabled the creation of a local network serving over 100 people. The wireless equipment had been chosen over a cable run in order to avoid a planning law that meant that only Public Telecoms Operators could string a wire across a street. In 2000 James Stevens and I wrote a manifesto 11 and publicised a proposed expansion of this locally tested idea to build a wider high-speed network, owned by its users. Under the banner, 'Trip the loop, make your switch, consume the net' the project was critical of, and opposed to, commercial telecoms providers. Partly conceived as a way to allow digital art practitioners to experiment with higher speed networks than the offerings available at the time could affordably allow, the project was taken up by a strongly technical crowd with strong free software ties. There were difficult technical problems to be overcome at both software and hardware levels. At the time the project received a huge amount of media attention from the mainstream media, and was mentioned in media outlets as diverse as The Economist, The Wall Street Journal, Scientific American and Slashdot. The idea was a welcome counter-story to the collapsing dot.com and telecoms bubbles, and perhaps chimed more with non-materialist desires after the excesses of the previous years. The model was quickly replicated elsewhere, especially in the States, and there is now a burgeoning wireless freenetwork community around the world. While Consume was not the first community wireless group - it had been prefigured by the Bay Area Wireless Group 12 and others - it was perhaps the first to grab media attention and gain some kind of wider momentum. In the last year or so, the Freenetworking Movement has begun to coalesce around new concerns, with recent discourses putting freenetworks and ownership and control of media infrastructure in a freedom of expression context. Control of a network means ultimate control over network traffic. Consume argued that the only way to ensure an autonomous media was to ensure that the network ownership was distributed. At the Open Cultures conference in Vienna, Eben Moglen, General Legal Counsel of the Free Software Foundation 13, addressed the role of free networks in delivering freedom of information. He further says that the three components of free information and hence a free media and freedom of expression are free software, free hardware and free networks._ He acknowledges public access to radio spectrum and wireless networking as being at the centre of attempts to create these new freenetworks. With both a growing number of people involved in creating freenetworks, and a number of senior commentators looking at commons-based approaches to spectrum regulation and the politics of network ownership, wireless freenetworking is at the centre of a growing and timely discourse. One of the ideas expressed in the Consume Manifesto 11 was that of a meshed network. A meshed network is one with no 'top' where each node on the network is connected to a number of neighbours offering many possible routes across it. In contrast to a star topology, which has nodes connected to hubs that then link to backbones, a meshed network is resistant to being controlled as constriction at one node causes data to find another route. In a star topology constriction at one central node controls all transfer to nodes towards the edge of the network. Most commercial broadband networks such as ADSL are star topologies rather than mesh ones. There are a number of ways of achieving a meshed network, either it can be created automatically using ad hoc mesh routing, or it can be managed by a Network Administrator and stitched together with agreements between Network Neighbours. The original idea of Consume was to create a metropolitan meshed network that would link users at the edge of the network together into a coherent local infrastructure. This connection would allow collective bargaining for back haul bandwidth, and a free local infrastructure that could support local content and an autonomous media. Finally, this meshed-edge network would provide a challenge to existing telecoms providers by being able to escape from the star topology and its built-in control points. Using an agreement between local network neighbours, the plan was to encourage a systemic de-centralisation and distribution of network ownership and operation. While there was a huge amount of activity by Freenetworkers, a managed or ad-hoc meshed network is not what emerged in London. What actually happened was that wireless freenetworks sprung up around activists, and, as the level of technical ability needed to install and operate nodes was initially high, this group of activists were people with a high degree of technical expertise. I'll term this group Geek Activists. To see whether a metropolitan meshed network could have emerged from this group, let's look at its population density. 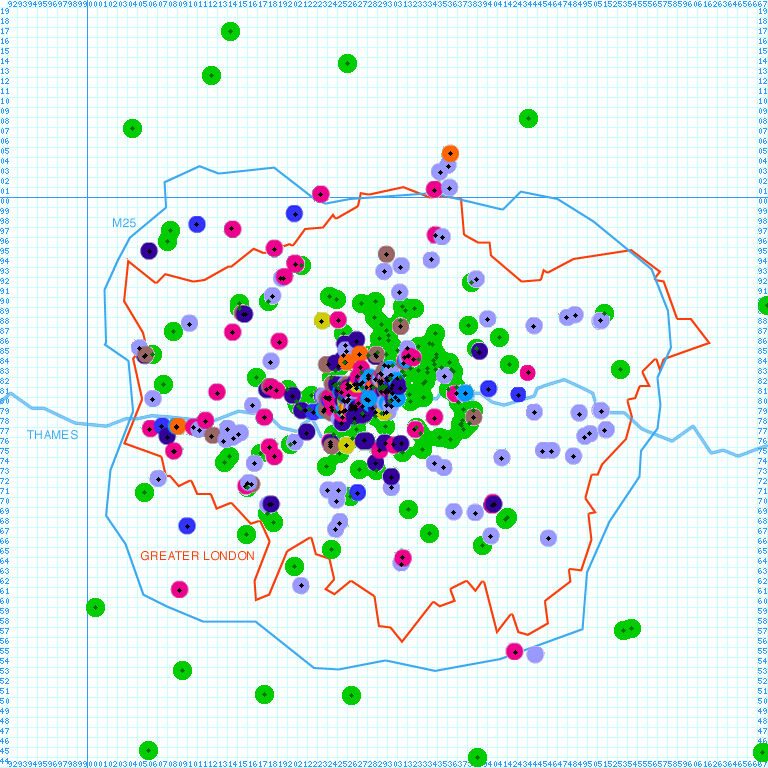 To cover the whole of London in a meshed network would need an overlapping patchwork of wireless networks. To see if this is realistic given the level of interest in wireless freenetworking in London here is a rough look at the density of activity to date. Here we see that while the density of activists needed to cover London is 1.25 the current density is only 0.11. There is a large shortfall of nodes or distribution of aptitude and interest if a city-wide meshed network is to be built. It should be noted that this calculation is extremely approximate. It does not take into account clustering and we find that activity is often centred in particular areas where there are higher densities of interested artistic and technically minded people. An example of a cluster is in the East End 15 where a strong group of networks has been built. The other major uncertainty is in the accuracy of public node databases, as at present there is no direct way of telling how much of presented data is stale. What we see as a result of this lack of node density is that the network topology that has mainly been adopted is not the meshed model, which requires an even distribution of nodes, but a star topology. I will call this the Access Point Model. An access point is simple wireless network device that is not capable of forming a meshed network due to lack of processing power and configurability. The access point is typically connected to an ADSL line and distributes the connection to those nearby. In this model it does not connect with its local network peers to form a local infrastructure, but does enable access to the internet by groups or people in a neighbourhood. This treats network access as a service like electricity or water. It is a centralised resource that is distributed outwards to 'consumers' at the edge of the network. As the gate keeper is the telco providing the ADSL connection, these networks are in effect extensions of the telco provider network rather than an alternative to it.While these networks are often offered for free for public use by their owners, this is often in breach of ADSL providers terms and conditions and as such these networks are susceptible to legal challenges ( as has happened in the US), and price control. While these networks do not in the long term do much to affect the ownership structure of the network, they have provided a huge wireless cloud that can be accessed by anybody, much of it offered for free by the network owners. In this way the collection of all these networks has created a de facto freenetwork, although not one that is autonomous. Many of the nodes installed are however reconfigurable and, given a significant shift in the density of installations, could be converted to form a contiguous meshed edge network. The core problem is one of density. Not enough people are participating in freenetworking for local interconnection to occur. For the situation to change, the number of freenetworkers per square kilometer needs to increase. How can this be achieved? Broadly, barriers to uptake need to be lowered, in particular the technical barriers. Running an internet network typically requires some specialist knowledge, perhaps an awareness of routing or Unix usage. While attempts to educate people, through clinics such as the Consume Clinics 17 or programs such as the University of Openess 18 are to be applauded, realistically these will not cause a quick shift in the level of knowledge in the population at large. Another way round this is to productise and automate, and this is happening both with products from the major suppliers, but also more specialist devices from Locust World 19, or 4G systems 20, that require little or no configuration and automatically build local meshes. Recently major manufacturers such as Linksys have started shipping Linux based access points (wet54g) 21, which may open the way for extremely low-cost devices capable of running a mesh network. A second barrier is the social barrier. In London in particular, people tend not to know their neighbours with communities often grouped around interest rather than location, and this contributes to forming a social barrier to local connection. Node databases are designed to enable people to locate network peers but this tends to locate only those who already know about freenetworking. To reach a wider audience formal agreements such as the Picopeering Agreement 61 are being created. These can provide a ready-made framework for people to negotiate local network connections, and a means of explanation by clearly representing the goals and conditions of participation in the network upfront. Cost barriers are appreciably falling. WLAN technology is on the same ever-downward cost curve and ever-upward performance curve as computers that is outlined in Moore's Law 22. The final barrier is one of visibility and awareness. There is a perception that wireless freenetworking is a purely technical pursuit, in part due to the early focus on solution of technical issues over the last years. The question of why you would want to build a freenetwork and what you might use it for is largely unasked, at least in the public eye. A strong focus on what can be done with freenetworks, and an exploration of the spaces opened up creatively and otherwise, would help to drive adoption of the freenetwork, which in turn would create more space for activity. Given a greater density of participants, a meshed metropolitan network could emerge and give rise to a larger freenetwork, and an autonomous media infrastructure might become possible. 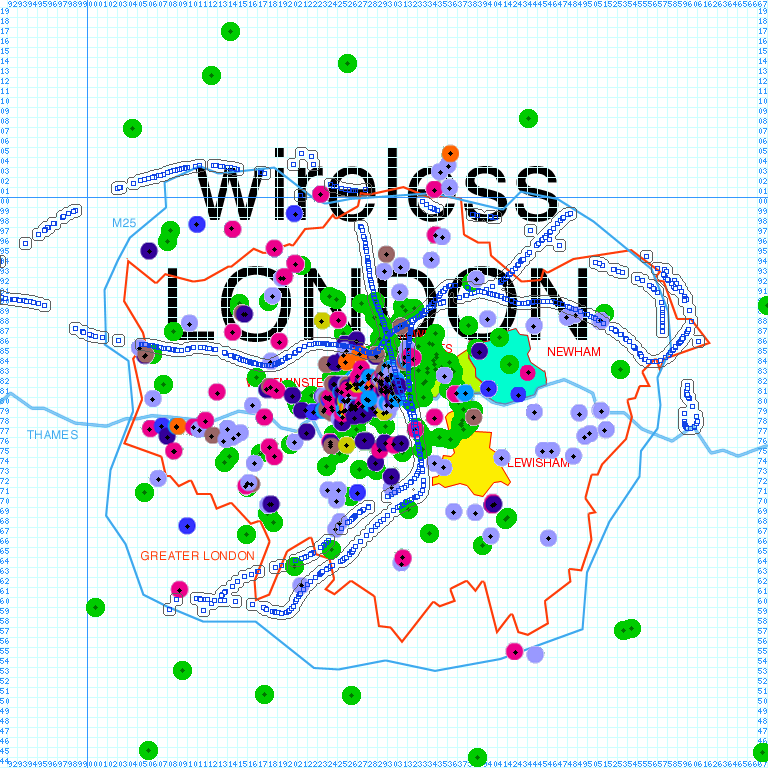 The second major group that are operating wireless networks in London are the Commercial Wireless Providers, largely made up of telecoms industry players such as BT and T-mobile, but with a number of start ups and independents represented as well, WiFi 23 as 802.11b is marketed has become a hugely hyped buzz word industry for commercial network providers. Back in 2000 the UK regulatory environment prohibited use of the 2.4 Ghz spectrum 'by way of business', and this precluded any paid-for services from being offered. The Radio Authority genuinely maintained that this legal framework was designed to benefit community networkers, though the fact that the restriction protected the 3G license auctioning business was probably not an unwanted side effect. WLAN and 3G technologies can provide similar functionality though the opportunity costs of spectrum usage are very different. Use of spectrum for WLAN is free of charge, whereas 3G requires spectrum licenses that were auctioned for billions of pounds. The 'by way of business' restriction effectively stopped commercial providers from using WLAN to build their new high speed networks and forced them into buying 3G licenses netting a substantial revenue for the government. From 2000 onwards WLAN received a lot of publicity in part due to the freenetwork developments, and this occurred just at the time of the 3G licensing fiasco. On the crest of the dot.com hype wave, telecoms companies massively over valued the 3G spectrum licenses and burdened themselves with unsustainable debt. At around the same time the story broke that freenetworkers were going to build a national WLAN based network that outperformed 3G, and this was taken up by finance houses such as Nomura 24 and subsequently in the mainstream media 25. This and the many other criticisms of the 3G spectrum valuations were contributing factors to the telecoms bust in Europe. Unable to compete in the 2.4 Ghz band, the telecoms companies saw WLAN as a threat and engaged in intense lobbying. A public consultation was undertaken by the Radio Authority and the law was subsequently changed in February 2002. Effectively this left commercial wireless providers 2 years behind freenetworkers in the UK though many had been operating test networks and fully fledged businesses in other countries. The model that commercial providers opted for was not the meshed infrastructure model that freenetworkers had proposed, or even on the provision of primary broadband network access. Oftel figures for Public Telecoms Operators show that the broadband access market was dominated by ADSL(49.5%) and cable in the UK (49.9%) 26, both ways re-purposing of existing plant. Commercial providers did not deliver broadband wirelessly in the UK or opt for the mom and pop wireless ISP model that had been popular in the states. Wireless doesn't even achieve a categorisation and is grouped under 'other' with all other broadband delivery technologies (0.3%). The commercial response to wireless was really to follow the access point model outlined above. They had perhaps seen the popularity of node databases with their charts of wireless enabled locations and instigated a model based on providing those. It was maybe a misunderstanding of the node map, which was originally designed as a way to find network peers, but one that provided no threat to the existing broadband provision model. These WiFi enabled locations were termed Hotspots and began to pop up in high value locations such as airports, hotels, stations and other areas where the target audience, the mobile professional could be found. The road warrior or office warrior 27, pausing between bites of a blueberry muffin to check sales leads on the way to baggage reclaim. What these locations had in common with each other, was that they were places where telecoms providers could negotiate an exclusive commercial contract with the location owner. Motorway service stations and airports are obvious examples, but restaurants such as Starbucks and Mcdonalds also followed suit. In these locations, the enclosure of spectrum that is license exempt as a free resource usable by everyone is achieved by virtue of an enforcement of the land right. The hotspot location, and hence access to the network 'in that location' is governed by who owns the physical space, the restaurant owner etc. This creates a local scarcity of network access that can then be sold at a high price. It is also interesting to note that these points exist at points of high user flow, super-nodes in the transport network, and are in effect intermodal control points between the information network and the physical one. The hotspot model is not one of blanket coverage, but of highly selective coverage. Hotspots cover places where people need network access and in the case of commercial hotspots are prepared to pay for it. Most providers offer access at what are actually quite high rates when compared to normal network access costs such as ADSL. One exception is Broadscape who offer what they call a 'virtually free' service as described here, which offers wireless access as a way of encouraging people to spend money in locations such as coffee shops. This model was pioneered by freenetworkers who encouraged proprietors of coffee shops to shoulder the minimal cost of installing access points and offering free internet access to their customers. Similar in idea to a cyber-cafe, but without the expense of installing and maintaining equipment, free network access is used as a way of attracting people to a location, and justified as a small marketing expense for the food and drink that will be sold. In this broadscape formalisation of the idea, the access becomes an integral part of the 'offering'- the blueberry and internet muffin. However the marketing and expansion effort has only just begun in the UK. BTopenzone for instance is planning a major expansion of up to 2000 hotspots this year including 232 in Mcdonalds, mainly in motorway service stations. On the 26th January 2004 they launched 'Free Wireless Week' offering subscribers the chance to use BTopenzone hotspots without charge for a week. But there are doubts about the viability of the hotspot model, with some commentators believing that there is no sustainable business model. Others point to the arrival of voice over WLAN as the real market that the UK hotspot providers are looking towards as an alternative delivery mechanism for 3G and similar services. The reason that it has been possible to operate freenetwork access point type nodes without charge is that once the equipment is installed, the incremental cost of allowing others to use it is very low. If you are already paying for network access for yourself, and have installed a wireless network, the additional cost of offering it to the public is negligible. The initial hardware costs are also low, at less than 100 GBP for an access point, and with running costs of 25 GBP per month it makes for a very affordable system. However, commercial hotspots are faced with significantly more costs over and above the minimal equipment and networking costs, such as a billing infrastructure, help desks, credit checking, location payments, maintenance contracts, share holder dividends and marketing, to name a few. This is inevitably reflected in prices charged for the service. It remains to be seen how these commercial models burdened with such overheads will compete with the freenetworking ones, and whether the marketing spend, and the strategy of local monopoly will be justified by the returns. Currently the consume database 5 mentions 143 active nodes in London, which places it as the second largest hotspot provider in London after BTopenzone with 173. In the last few years public sector bodies in London such as local authorities have begun to use WLAN. Several different organisations are currently making pilot studies and starting wireless initiatives. This section looks at a selection of these projects. In other parts of the country public sector wireless initiatives focus on providing broadband access to regions that have not yet met BT ADSL trigger levels or have no cable TV provider and hence have no commercial high-speed internet supplier. In these cases there is no other option but to create a new infrastructure and in some areas this has been led by councils often in partnership with community groups. These projects are often framed by the 'digital divide' discourse, specifically the divide of access to high speed networking. Regions without access are simply not able to participate in the emerging 'information society' or the 'information economy'. As such funding of the projects has often been enabled through regional development agencies, many of these projects are as part of long term regeneration budgets. In London there is no real shortage of access to network capacity, with much of the city cabled with fibre, and all of it within range of ADSL enabled British Telecom exchanges with many different services on offer depending on budget. In London issues often centre around social inclusion, who has the knowledge and ability to access network technology, and who has the means to be able to afford it. Wireless with its flexible topologies, and low hardware costs is being seen in London as a way of physically bringing network access into local communities, and as a way for public bodies to encourage participation by direct offer of service. Other councils are using wireless as a way of attracting people to physical places, to encourage a more fluid use of public spaces within the city, to increase the functionality of Civic Centres, to enhance the Public Library product offering. Westminster City Council is currently piloting a wireless network with its Wireless City concept. "The concept of the Wireless City is potentially one of the most exciting developments in Westminster's history. It will allow us to offer opportunity to our residents through community education schemes on our housing estates and integrated social service provision across the city. We will be better able to reduce the threat and the fear of crime through a flexible approach to community safety, cleansing and CCTV - reacting to events and developments as they happen. It will also help us maintain low taxes through the savings that the scheme can offer. The pilot scheme is already delivering benefits to the Council and the police in our fight against drug crime in central London. Arrests have already been made. As we continue to prove the scheme and roll it out to communities across the City we can share real-time information with all our officers, with other public service providers and with our residents and businesses. Westminster is set to become a community united by cutting edge technology and sharing in the benefits of progress." The project objectives of supporting social services and education though wireless technologies seem mainly of benefit to the council officers - we can envision the social service operative equipped with state of the art wireless information tools at the point of sale. In the Westminster report 'Implementing Electronic Government 2' 34 much is made of the new CSI, a customer relationship management system designed to enable greater participation in e-government. This translates to database cross referencing and the ability of council officers to access information collected from any point in the organisation as needed. WLAN in this context allows extension of access to the CSI, providing an extension of the Westminster council corporate LAN and the town hall office environment. It provides an infrastructure for data collection and enforcement, extending the council into the physical space of the city. From the customer/citizen point of view the network also enables new user interfaces to the council organisation with information kiosks in libraries and on the street becoming the public's points of access to the CSi. Notably the network also enables a more pervasive surveillance architecture, lowering the cost of connecting additional city centre CCTV modules, offering opportunity, delivering beneficial arrests. The network provides a way of connecting noise monitoring equipment installed on lamp posts to investigate the 17,000 noise complaints received by the council every year. 35 One might term this pervasive local government. The network is publicly owned and maintained, that is to say it is owned and administered by Westminster Council. While nominally this means that the voting and local tax paying community are 'owners' of the infrastructure, in practice this is administered through a long and indirect accountability chain. The decision making process that would allow a resident who wished to influence the way the network was run, would perhaps have to make a case through a complaint procedure, or in the end by voting at a local election. These methods are unlikely to be effective for particular goals and tend to be only used as last resort when serious fault is found. The ownership structure does not encourage direct participation, and the usage of the network as delivery mechanism for 'service' and its status as wide area council corporate LAN reflects that. This creation of public sector corporate WLAN infrastructures is not without its problems as the experience of the London Borough of Newham shows. In 2000 they pioneered the interconnection of hundreds of council premises using WLAN as a way of taking control of their in-house networking requirements, but ran into problems of spectrum co-existence. Note that the criminality referred to here is not the usage of the license exempt (ISM) radio spectrum as a local uplink, as this is completely permissible under the spectrum regulations, and license exemption specifically does not legislate for interference. The criminality derives from using the licensed FM radio spectrum without a license from the regulator. The FM spectrum is licensed for a fee and as such effectively 'owned' by commercial and public broadcasters. It is not a space for direct public usage, though the existence of 'pirate' radio shows that there is clearly demand for such a public medium. The clash between the council's spectrum usage for network connectivity and the 'pirate' radio uplink would perhaps have been resolvable had the parties been able to negotiate to share infrastructure and hence reconfigure their use of the spectrum. As the council cannot enter into dialog with the criminal 'pirate' radio users apart from through enforcement mechanisms the space becomes contested and is degraded for everyone. A separate project in Newham, Newham.net 38 is a publicly funded network initiative based around the Carpenters Road estate in Newham. It has delivered a cabled network infrastructure to 70% of the residents in the estate that provides a number of services including internet access, TV and video on demand to residents. The service is based around a high-speed wired network and an interactive TV platform. The high take up is due to the fully funded nature of the network and the familiar TV interface. They are currently looking at extending the service to other buildings using wireless, and experimenting with PC connections to the network. The network is used by residents for both external TV and internet and also for internal usage such as community generated TV programming that has been popular with residents. Another initiative in East London by Poplar Harca, a provider of social housing in Tower Hamlets, is piloting a wireless network as a way of providing low-cost broadband access to its residents. A number of wireless networks have been installed as part of their strategic goal to promote residential connectivity, and wireless links have also been used to connect community buildings to each other. The focus of the initiative is to provide access and to promote participation in local community media. This ties in with other Poplar Harca initiatives that focus on skills transfer such as computer classes and DJ workshops that are run in the community centre. The network is being created in association with LTHnet, the network run by residents of the Limehouse Town Hall studio space and Youarehere 39 a network initiative of net culture magazine Mute. Both of these groups have long focused on participatory approaches, running workshops where people can learn about network building and administration. This points to a future network which can connect residents and cultural centres and can provide the infrastructure for an independent local media, whilst encouraging participation in the operation of the network. The model used here is one of establishing a number of network nodes and brokering connections with other local networks in order to seed the growth of a local network along freenetwork lines. The Poplar Harca Housing Network becomes another self-provider in the locality, responsible for maintaining its own network and its connections with its network peers but relying on protocol and relationships with network peers to make the network function in the wider local area. The technology choice of Locust-World Mesh Boxes 19 provides a relatively easy technical path for extension of the network by other people in the area. The network is owned by the Poplar Harca Social Housing Organisation, a non-profit company which operates the former local authority owned buildings. The company has both local authority and resident directors, with residents making up the largest group. 40 In this way there is direct accountability between the residents (users) and the network administration. In Lewisham a new initiative between CBN 62 and LB Lewisham takes both the models of community provision used by Poplar Harca and the creation of a corporate LAN one stage further to develop a local broadband service. While the project shares some of the goals of Westminster's Wireless City in providing extended access to council corporate LAN around the borough, there is also a strong emphasis on delivering a local broadband service with the participation of local freenetwork and community networking groups, voluntary sector organisations and cultural institutions. The organisational structure used here to create and administrate the network is described as a 'Social Enterprise'. This organisation collects revenue, is funded by its users and has a sustainable revenue stream, thus differentiating it from a purely fully funded public service paid for by taxes. However in contrast to a private company, the social enterprise is owned by its stake-holders in this case the network owners, who are participants in the governance structure of the organisation. Profits from the social enterprise are likewise reinvested in the organisation, and further social goals are served. Some theorists notably the IEEE 43 and David Isenberg 44 argue that access networks are natural monopolies and are not as such suitable arenas in which free market competition can be expected to provide the most efficient solution in terms of network performance. Different ownership structures are needed to ensure that network users are represented in the operation of their networks, to protect them from monopolistic practices and price fixing or other control such as encroachment on media freedoms. The Social Enterprise approach seeks to create open yet accountable and inclusive structures that can include both residents, business users, Local Authorities and other stake-holders to manage the network infrastructure to avoid these pitfalls. Public sector WLAN is appearing at the boundaries between existing local media and the operations of public sector bodies that administer local physical spaces. In Westminster WLAN forms a backbone between DJ beat filled sleepless nights and the daytime desks of the noise pollution office. In LB Newham WLAN marks the degradation of Newham's corporate LAN by pirate radio uplinkers, email colliding with MP3. In Newham WLAN is extending the reach of interactive TV, in Poplar Harca WLAN is a hope for social inclusion in a participatory local media, and in Lewisham WLAN serves as a backbone between cultural institutions to jump start a local media-rich network. The variety of uses that WLAN is being used for is a testament to the versatility of the underlying IP networking and its ability to support many media types without changing the core network. At the same time the ownership and accountability structures of each of these projects are shaping who has access to these new wireless infrastructures, what uses they are put to and the character of the media that emerges from them. The Public Sector includes the public space of the city soon to be media-augmented with WLAN. Whether our public media spaces are to be characterised by enforcement, interference, piracy, participation, inclusion, or social enterprise is a rich debate currently being argued in pilot studies and initiatives across the city which will certainly shape the diverse futures of Wireless London. "I see the facility of deploying complex and multi-modal services across networks with a very low cost as unprecedented. SW and CB Radio, community cable TV and other networks have more advanced and probably at this point, more popular use histories, but the mode of use of these media has always been single-mode: talking and listening, or broadcasting and watching. We may use the same network but be doing completely disconnected things." 46 Saul Albert's survey response. The preceding discussion has focused on groups who actively represent their networks either in public databases or through reports that satisfy the necessities of public accountability. However one of the prominent features of IT industry sales in the last 3 years has been WLAN systems or WiFi. You couldn't read a company report without being pointed to the meteoric rise of WiFi sales in an otherwise flat market, and 2003 was the best year yet. While we have been unable to find accurate figures for sales of WLAN equipment in London or even the UK or Europe, we can point to the fact that a huge amount of WLAN equipment has been sold in the last year, with the following circumstantial evidence. Whatever the exact figures, the uptake of WLAN technology has been impressive, but with only 829 publicly displayed nodes from both commercial and freenetwork providers, and the few emerging in public sector pilots, where is it all being installed? In order to get a picture of how much installed wireless equipment actually exists in London, we needed a way of direct measurement. Luckily, wireless networks are like light bulbs and broadcast signal into the space around them, not just in areas of intended use but also in other directions. Depending on the antenna used these signals can be visible up to 40 km away in line of sight. Signal spills out of windows into streets, into other buildings, and up into the air. This means that there is a wireless network cloud across the city, and using a standard laptop WLAN card and GPS it is possible to 'see' the networks in your vicinity, and if they are open, you can connect and get access to the network. This practice normally termed 'war driving' has been popular since wireless networks started appearing, and in the last years has been the bugbear of a recurring media story that highlights the inherent insecurity of wireless networks. While 802.11b has a built in security mechanism WEP, it doesn't work well and is easily circumvented. Additionally, a large number of networks are installed without any security enabled at all, either intentionally or not. For freenetworkers open networks are not a problem but a benefit. An open wireless cloud is precisely what they are trying to achieve. In common with other public networks such as the Internet, one must not assume that the network is secure, and security must be implemented at a machine or service level. Don't connect a wireless device to a network that you want to be secure. Make sure your wireless (or Internet) connected laptop is secured perhaps with a firewall. If you want to engage in secure communications across the network use a secure method such as SSH or a virtual private network. Open you network for public use! In March 2002 a security survey 52 in London by Digilog in association with the Cybercrime unit and the ICC, the commercial crime unit of the chamber of commerce, war drove central London in smart cars. They found 5000 WLANs 94% of them open. In order to get a current snapshot of the whole of London we contacted Capital Radio, who offered the use of their traffic spotter plane 'The Flying Eye' as a platform from which to get an aerial overview. Tired of the incessant war related media chatter of the last few years, we've taken the opportunity to steer clear of the 'warflying' moniker and use instead the term 'Air Stumbling'. After some examination of previous Air Stumbles 53, on 22nd Feb 2003 James Stevens hitched a ride in the 4 seater plane. Using a directional antenna, a GPS and a laptop running network discovery program Netstumbler 54, he found 1525 nodes along the flight path, 50 % of which were open. This is a very rough order of magnitude calculation and only takes into account those nodes visible to the air and with a sufficient signal strength to reach the plane at its cruising altitude. Normal access points with standard antennas are unlikely to show up on this survey as the flight altitude was at the limit of their range, normally taken to be 250m. 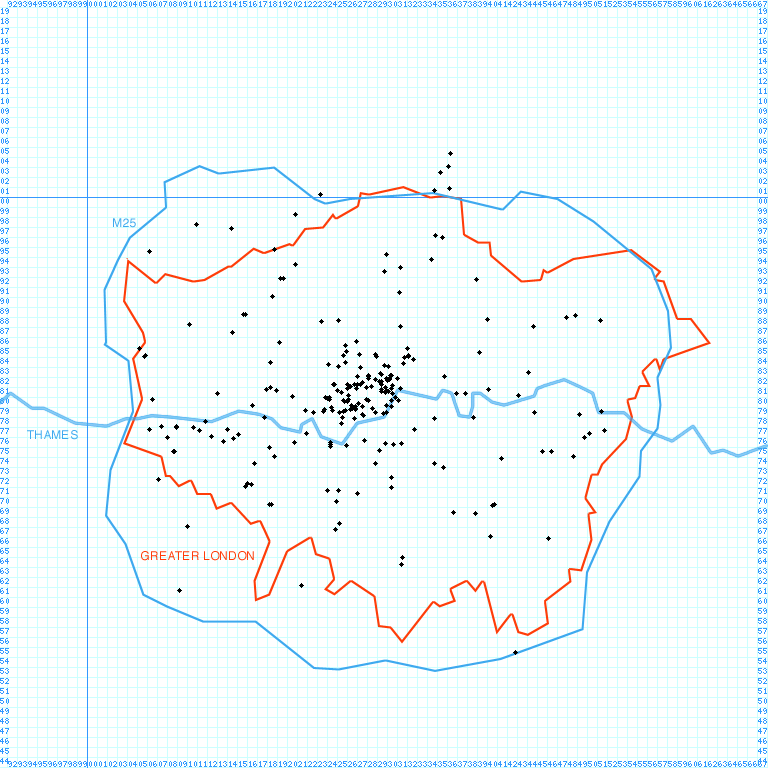 However the main point of the study was to show that there is a large installed base of nodes that cover London with a fairly complete wireless cloud, far in excess of the publicly displayed node maps of either the commercial operators or freenetworkers. The actual node density at 15.5 nkm^-2 is far in excess of the 0.11 geek activist node density mentioned in the previous section, and also far above the 1.25 node density required for a fully meshed metropolitan network. In fact the coverage is such that just considering the percentage of nodes either open intentionally or by default, there already exists a wireless freenetwork in much of the city. Projects such as the Wigle initiative in the States 9 have focused on this phenomenon and provide global coverage maps submitted by anonymous wireless cartographers and stumblers. Their database is growing fast and within the 2 days when I examined it, the node count rose from 700,000 nodes to 778,000 worldwide. London is as yet underrepresented in this database, with only one 428 node track compared to these tentative stumbles that we have made. Wireless nodes broadcast more than just their whereabouts into the public spectrum. Among other things they show a unique identifier for each network interface which is called a MAC address and the network name which is called an SSID. SSIDs are the names that a user is presented with when they choose between available networks and are set during configuration by the node owner. They can tell us something about who the owners are and we can cross reference them against what we can see in public databases. In this stumble we find that approximately 40% of access points are running with the manufacturers factory default SSID. settings. This points to equipment being used straight out of the box with little or no configuration and suggests that many networks may be open because of a lack of configuration, creating freenetworks by default. 209 The Linksys Group, Inc.
17 Global Sun Technology, Inc.
12 Senao International Co., Ltd. The first 6 digits of a MAC address are termed an OUI. This is an identifier maintained at the IEEE 55 which uniquely identifies the manufacturer. By tallying occurrences of different OUIs in the stumble we are able to get a good picture of the 802.11b equipment market. Here we see that, Netgear, Linksys and D-link are the market leaders in London. By matching SSIDs with node names in public freenetwork node databases such as the consume database and commercial hotspot databases such as Jiwire 7, we can get some kind of picture of freenetwork and commercial activity. While it could be that the strong showing of commercial nodes is due to the fact that this flight concentrates on roads and city centre, where most of the density of activity for commercial operators occurs, it is worth looking at the measured densities. Here we see roughly 46% of the expected commercial registrations that we would expect to over-fly and 35% of the expected Consume registrations. This suggests that the over-fly sees around half of the nodes it over-flies, probably due to the altitude taking the plane out of range of nodes, etc. What it does show us is that the relationship between the numbers of Consume nodes and commercial hotspots detected largely mirrors the ratio of those measured - 4.8 vs 6.25. The very small sample size here makes the uncertainty in these figures rather high. For example, one extra Consume node seen would have changed the ratio to 4.8 vs 5. Also, there are some problems with the method of matching SSIDs with Consume database entries, which may skew results. Node names in the database are not necessarily SSIDs. 'Hampstead' occurs in the stumble log and 'Hampstead Heath' in the Consume database. As no definitive information such as MAC address is kept about nodes in the Consume Db this SSID. survey can only give a very rough indication. SSIDs can sometimes tell you something about the owners of the networks or other less formally coded information. At a US conference two years ago, sysadmins changed SSIDs during the keynote to make jokes about the speech. Here's a selection from the flyover. )(arthur <- SSID containing the )( open network symbol from war chalking 33 shows that the user is offering a freenetwork here. FM-lon10 <- FM radio station uplink? Cazs Wireless Network <- clink street diaspora? WLAN equipment was originally developed for indoor use in the office and in the home, in order to un-tether laptops and ease the installation of networks by eliminating cable runs. Their use outdoor in hotspots and in freenetwork infrastructure was and still is perhaps a secondary usage of the technology, though a powerful one. While the existing wireless explosion is being attributed to people wishing to spread their broadband to every room in the house, analysts suggest that 2004 will see the arrival of media adapters, that use WLANs to connect all the digital and networked devices that are beginning to appear in the home. Digital camera's, MP3 players, digital video camera's, TV recorders, baby monitors, cordless telephones, computers, games machines et.al. can all be linked together using home networks, and then connected to the external internet. Such a home network is set to bridge the gap between networked devices in the home but also between the video camera and the television, the computer and the stereo. Linux users have for some time been building media servers for the living room based around computers that blur all the format boundaries in home entertainment, and fan-less devices based on small mini-itx motherboards are appearing in all shapes and forms. 56 These types of devices are also appearing in models from familiar consumer electronics suppliers. Combined with a home network, digital content creation tools and media servers, there is the potential for the home to become a site of content creation on a wide scale. If this is combined with a local high speed free or extremely low cost broadband network infrastructure then the conditions will exist for the creation of a user-driven media. This presents the possibility of a rich media version of what the internet has done for text and image, with all areas in the chain of media creation, post production, distribution and viewing available at the edge of the network rather than in central locations. Such developments may facilitate greater media autonomy. If the view of the future outlined in the previous section sounds familiar, it is. The story about an autonomous media prefigures each wave of technological change in the media. As media developments have shown in the last few years, during a period when the Internet was supposed to free consumers from the dominant media, we see that media ownership continues to be dominated by a small number of large players. The existence of the network has rather than reversed the balance between 'consumer' and producer in favour of the consumer, perhaps allowed new spaces for the market driven media to inhabit. At the same time the very same network has spawned developments such as peer to peer file sharing that has decimated music industry revenues, so this increasing fluidity has not been entirely a one-way street. The network cuts both ways. In other networks such as mobile telephones, where the network is more tightly controlled, and content provision on the network and billing infrastructures more tightly integrated, there have been much larger gains for the commercial content provider. 10% of music industry revenue in 2003 was from downloading of ring tones. 57 An Imode service offering 16 Manga backdrops a month for mobile phone screens signed up 2 million subscribers at $2 a month. Figures like these suggest that ownership of a network and the content that is delivered over it can be linked. The Home Network Commercial Providers are using the opportunity provided by the technological changes associated with the arrival of WLANs to move into the home, closer to the living room and the possibilities afforded by a closer integration with the site of consumer's media usage. The message of Consume was to take control of your own network infrastructure, let the ownership of the network expand from the personal non-marketed space of the home or office out into the wider public spaces. In a similar way, commercial vendors are using exactly the same WLAN technology to extend the reach of their marketed ADSL networks into the home. In the UK, BT is planning to offer a "triple play" of a fixed broadband line, wireless home network and public WiFi. In France and Germany, the incumbent service providers are packaging DSL services with WiFi networking for the home. As well as being used as a way to reverse media delivery network hierarchies WLAN is also being used as a way of extending those hierarchies into the entertainment cortex of the surround-sound enabled living room, making sure that the signal is heard in every room of the house. There has been a huge growth in the use of WLANs in London, a trend which looks set to continue. The freenetworking movement is maturing and making significant advances in terms of uptake, technical solutions, social networks and a discourse of media freedom. Commercial WLAN providers are this year beginning a substantial marketing push to sell high value hotspot offerings, but with perhaps no proven business model. A number of public sector WLAN initiatives, many in partnership with community and freenetwork groups, are being started around the city with differing ownership models and media agendas. WLANs are being deployed in large numbers in businesses but increasingly in the home as a way of bringing the various digital media technologies together. Many of these networks are open and provide a de facto freenetwork. These factors point towards a large and growing mainstream population beyond the 'early adopters' who pioneered the use of the technology and who are using WLAN to cater for their own network needs. This group forms a large potential audience for whom a Wireless Festival would be relevant. This year several factors combine to suggest that a Wireless Festival would be a relevant proposition in the coming year. The marketing of commercial hotspots will create a public awareness of WLANs and hotspots. This will focus on WLANs as high value services or products, offering an empowerment in narrow terms of convenience. At the same time the freenetworking movement is becoming increasingly vocal and organised and is expanding rapidly across Europe and the world in many different forms as a self-provided alternative to existing networks. In short, 2004 is a year when a restatement and collection of wireless freenetworking ideas would highlight the progress made in the last years and provide a counter-point and context for the marketing of commercial WLANs, adding to the public debate. As WLANs look set to move into the living room this year, a festival now would focus on what that change means in terms of control, media creation and usage. By publicising alternative usages of existing installations owners of the huge installed de facto free wireless network that exists could be made aware of their role as freenetwork providers and be encouraged to build a public city-wide infrastructure. As low-cost meshed networking products come online perhaps the dream of a metropolitan meshed network can become a reality. Networks are only as useful as what they are used for, what connections and exchange they allow, what media can be created with them, what social relations enabled. A wireless festival should focus on the use of WLAN, and the creative, artistic and practical possibilities that these new spaces can support. Innovative uses of WLAN are already producing new and unexpected media arts directions. The collection and presentation of these should provide further stimulus for new forms to emerge and show how local and democratised content networks can be used. In the same way that changes in media technologies have prefigured new forms of content, a wireless festival could explore the directions that wireless networked media is taking in London. The format of such a festival is explored further in 'The Wireless Event Format' document 59. Let's celebrate the achievements of the last years and show the future directions and cultural possibilities of the freenetwork and wireless communities in London. I would like to thank the following for their participation and support in the writing of this document. Informal.org.uk - web hosting, mail lists and survey implementation.